We have gathered together this morning to say a fond farewell to someone who made public education and fire prevention more meaningful for a great many people of all ages all across America. There will be those who will not see the impact which Sparkles, when coupled with the loving support of Dayna Hilton, had on fire safety education. They will glance over the things which have happened because of the ability of younger children to bond with Firefighter Dayna and Sparkles the fire safety dog. They will not give credit here where credit is due. But that is my purpose here today. 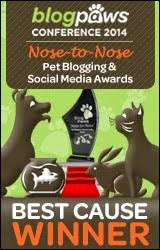 I intend to remind the world of the impact of one individual canine character of the world's stage. It is my job here today to bring meaning to the impact which Sparkles had on the lifesaving work which Dayna has done for a long time now. 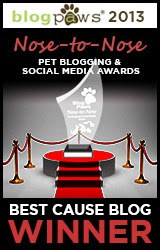 Dayna wanted me to express her thought that today is not a time to be sad, but a celebration of Sparkles the Fire Safety Dog’s life and the time she spent here on earth with the fire prevention community..
Let me tell you a little bit about Sparkles. She had a very rough beginning to her life. She was rescued from a home with 62 other dogs and adopted at age 4 by Dayna and her family. However, thanks to the loving efforts of Dayna Hilton, she went from being a rescued dog to fire safety dog who was able to help others learn their fire safety lessons. 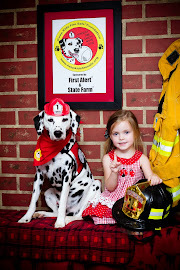 Over time, Sparkles the Fire Safety Dog became known for her red toenails and a tail that wagged non-stop as she helped Dayna, her educational partner, share their fire safety message. Dayna once told me that the only time that her tail wasn’t wagging was when she was sleeping. 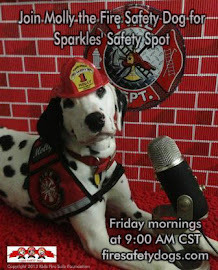 In her years as a four-legged fire safety educator, Sparkles did more than many in the world of human being. She participated in a Congressional briefing in Washington, DC, appeared on a national morning show in New York City, shared safety tips on a major 24 hour pre-school television channel for three years. Let me share a story with you, a story about a young lady named Angelica. To date, we are aware of the fact that the efforts of Firefighter Dayna, and her faithful assistant Sparkles, have helped save the lives of two children (one of the pictures that I will have there is the picture of Angelica and Sparkles) and their two families. During a meeting with one of the two children, five year old Angelica, Dayna was pleased when this young lady shared the story of how Sparkles and Dayna helped to save her life. The young lady stated to Firefighter Dayna that, "… I was in bed under the 'covers' and the smoke came. 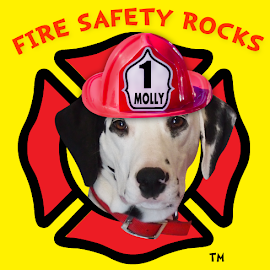 I crawled out of bed and crawled low, just like Sparkles [the Fire Safety Dog] showed me to. I said, 'C'mon daddy, you have to get on the floor and crawl low like Sparkles." By this time, her dad was disoriented because he had been standing in the smoke filled room and thankfully he was able to follow Angelica out of the house. The firefighters who fought that blaze later shared with Dayna that Angelica's father followed her out of the home and they said that as soon as he reached the door, they scooped him up and took him to the hospital (where he spent 7 days there~ 4 in ICU). Immediately after they carried him away from the front door, the firefighters stated that the home flashed over became totally engulfed in flames. Dayna shared a personal story with me. She said that when she realized that Sparkles wouldn’t be with us much longer, she was very sad at the thought of losing her good friend and partner. 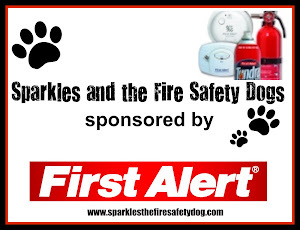 As she was going through this period, a friend shared with her that Sparkles had done her work well and that setting up the foundation to carry on the fire safety dogs and her fire safety program was an important accomplishment. That along with the Sparkles’ Pathway effort, have given Dayna great peace. Even though Sparkles is not longer here, she is still with us in spirit as we perform the important work of teaching people how to live safely. In this way Dayna has created a living monument to her friend and fire safety sidekick. In this way, her work will be continued and remembered for many years to come.